Goodwell, Okla.-Before their largest crowd in recent history, the Panhandle State football team gave fans and alumni a Homecoming matchup to remember. Guests were treated to a lively parade and jam-packed pre-game tailgate prior to the watching the Aggies earn their second Sooner Athletic Conference win of the season against Wayland Baptist (20-17). Up 20-3 at halftime, the Aggies allowed their opponents to stage a second-half comeback, with Wayland scoring seven points in each of the final two quarters. Miscues on the offensive side of the ball, along with four 15-yard penalties after the half, offered unearned momentum for the Pioneers. The Darkside Defense contained the would-be catastrophe by holding their opponents to negative rushing yards (-24) and less than 200 yards passing (196). A concerted defensive effort by Panhandle State, stuck the Pioneers with a 1-13 conversion rate on third down and brought six sacks on Wayland’s Nick Quintero, who received steady pressure at the line for the duration of the game. Freshman kicker Eduardo Villarreal put the first points on the board for Panhandle, by way of a 23-yard field goal on the Aggies’ opening drive. Special teams play shined throughout the day, as Guymon native, freshman Javier Medina booted his first three kickoffs into the end zone for touch backs. The Aggies would score again on their second drive of the game, adding seven points on a fumbled Pioneer football, recovered by freshman Kaleb Gutierrez and returned 19 yards for a touchdown. Wayland was forced to punt in all three first-quarter possessions and amassed a mere 29 yards in the first 15 minutes of play. 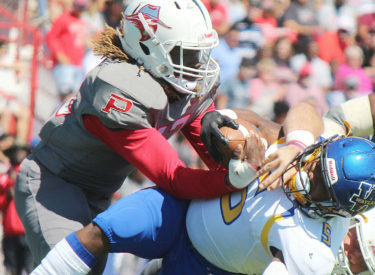 Aggie QB John Polston suffered a sack at the close of the first quarter, and the lost ball ended up in the hands of the Pioneers deep in Aggie territory. WBU entered the red zone, but were stopped short of a first down bringing out the field goal unit; the kick fell short leaving the score 10-0 as the Aggies took over on their own 20-yardline. In their opening drive of the second quarter, the Aggies put together three first-down fronts before being denied progression of four yards and forcing the punt. Wayland went out on three plays on the subsequent drive, and then gave the Aggies their first three-and-out series of the game. A pre-snap penalty gave the Pioneers possession on the OPSU-32 which helped set up an 18-yard field goal with seven minutes left in the first half. Panhandle State came back with a nine-lay 49-yard drive that was capped off with a 17-yard touchdown pass from senior Brandon Ramon to wideout Miquel Hudson. With two minutes remaining, Quintero took his first of six sacks from the Aggie defense. Senior linebacker D’Darrin Primes broke through with the QB sack for a loss of 12 yards on the play. Wayland’s ensuing punt set the Aggies up on the plus 29 yard line with a minute on the clock. They traveled nine yards to the WAY-20 giving Medina a shot at a 37-yard field goal. The kick was good and the team headed into the locker room with a 20-3 lead over their regional rivals. The Aggies struggled through the third quarter, giving up 37 yards on two untimely penalties in Waland’s opening drive. The Pioneers capitalized with five first down conversions in the series, including a goal line stand that resulted in an eight-yard run-in for their first TD of the game. The score remained 20-10 at the start of the final stanza. Panhandle State was stopped short with two consecutive three-and-out sets to open the fourth quarter. In Wayland’s first series, senior Jawan Purifoy put Quintero down with his first sack of the season. WBU rallied back in their second drive, taking five plays 62 yards downfield for a Pioneers touchdown. With the score becoming too close for comfort (20-17), the Aggies issued a 15-play progression that took them all the way inside Wayland’s five yard line. On fourth down with four yards to go, Bacone College transfer, quarterback Josh Robbins was sent in for a surprise play; the reverse pass came from Miquel Hudson to Robbins, who was unable to secure the catch in the end zone. Wayland was held on their own side of the field for the remaining 2:35 and Quintero suffered two more quarterback sacks on his final stand. The Aggies took a knee on the final snap, sealing up a Homecoming victory in front of more than 1,700 proud Panhandle State fans. The Aggies finished with 287 yards of total offense (127 rushing and 160 passing); they acquired only 50 yards in the second half and gave away 66 second-half yards in penalties. Running backs RJ Stevens and Carlos Ransburgh shared the workload on the ground, with Stevens hauling 13 carries for 50 yards and Ransburgh running ten plays for 42 yards. Hudson was the primary target in the air assault, with five receptions for 40 yards and one TD. Sophomore Jake Martinez al made his presence known with four completions for 24 yards. Ramon took the lead at the QB position, completing 17 of 26 attempts for 133 passing yards and one touchdown. With a stellar performance on special teams, Villarreal had three punts land inside the 20 and one touchback. Lead returner Kevin Carter had four returns totaling 35 yards and Hudson had a long kickoff return for 41 yards. Each kicker had successful field goal attempts and Medina averaged over 63 yards on kickoff with three touchbacks in the game. Defensively, the Aggies were led by Purifoy who had six tackles, one sack and one tackle for loss. Jaylon Thomas finished with 2.5 sacks, 2.5 TFL and 3.5 tackles. D’Darrin Primes and Diamante Pounds each had one sack and 4.5 tackles in the game; Pounds also contributed one forced fumble and two TFL. Aggie fans will have to wait until Oct. 20 to see their team back at Anchor D Stadium, when they host Arizona Christian for a 2 p.m. SAC matchup. Panhandle State football faces three lengthy road trips starting with a venture to Batesville, Ark. to meet with Lyon College this Saturday, Sept. 29 at 5 p.m. Live stats and video streaming will be offered online, with links available on the football schedule page at opsuaggies.com.